Dutchman Pieter Heerema briefly took the overall lead of the Dragon World Championship after winning race 2, but defending champion Andy Beadsworth hit back with a win in race 3 to move into the overall lead. 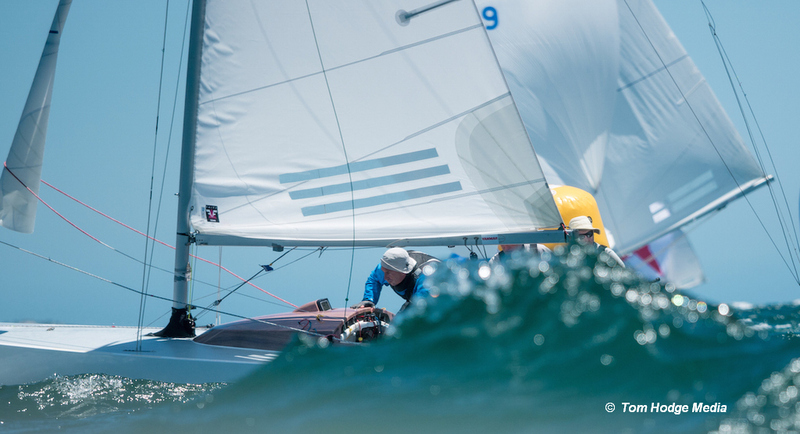 After a short wait for the wind to settle, Pieter Heerema sailing with Lars Hendriksen and George Leonchuck, took race 2 ahead of Russia’s Dmitry Samokhin, Andrey Kirilyuk and Jasper Harding with Klaus Diederichs, Jamie Lea and Diego Negri taking third place. This put Heerema is in a three-way tie on seven points with Grant Gordon, Ruairidh Scott, Sophia Weguelin and James Williamson of Britain, and Andy Beadsworth, Ali Tezdiker and Simon Fry. In the second race of the day (R3) it was Beadsworth who took his first win of the championship to move into the overall lead ahead of Grant Gordon, with Klaus Diederichs, Jamie Lea and Diego Negri in third place. Russia’s Anatoly Loginov, Vadim Statsenko and Alexander Shalagin are now fourth overall with Pieter Heerema dropping to fifth. In sixth place is the Japan boat skipperd by Peter Gilmour sailing with Yasuhiro Yaji and Sam Gilmour. Nick Rogers, Leigh Behrens and Simon Burrows of Australia lead the Corinthian series in tenth place overall.